World number one miner BHP Billiton on Wednesday bought additional exploration plots near its Olympic Dam mine and expansion project from Tasman Resources. 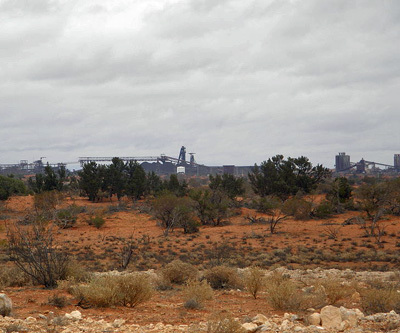 BHP paid $3 million for five tenements in the same geological zone as Olympic Dam, bringing the money spent by the miner to increase the footprint of the massive uranium-copper-gold-silver project this year to more than $20 million. BHP has already received government approval for the mammoth $30 billion expansion and also has a long-term labour agreement in place at the existing operations. BHP's board was to make a decision on the project this year, but given its intention to cut back a $80 billion capex programme, work may not start soon even if it is approved. A JP Morgan research note out last week suggest it will not go ahead "for at least three or four years, if at all". The ambitious project in South Australia's outback would be the world's biggest open pit and also include the construction of 270km of powerlines, a 400 km pipeline, a new desalination plant and a 105km railway. The planned open pit mine would be adjacent to the current Olympic Dam underground operation and would exploit what is likely the world's largest uranium deposit and possibly the fourth largest copper and gold resource on the planet. According to BHP the project would require a construction workforce averaging 4,000, with a peak of about 6,000 people until full production is reached and long-term a doubling of the existing operational workforce to 8,000. The worker village is being expanded to cater for 10,000 and building has already begun on a new airstrip capable of handling 737 aircraft. An idea of the olympian effort required to construct the mine and the size of the undertaking is clear from the fact that trucks will haul the 350 metre thick layer overburden 24/7 for five to six years just to reach the ore body. The rock storage facility would cover approximately 6,720 hectares, and it would eventually be about 150 metres high. Image of existing Olympic Dam shafts by Geomartin.